endorsement deals,if you think that this comedians are making a fool of themselves for free,then your making a very big mistake,the truth of the matter right now is that being funny is now a big business in Nigeria and most of Nigeria's top funniest comedians now laugh to the Bank on a regular basis. In this post we will check out the current and funniest Top 12 comedians in Nigeria right now. In no particular order here is a list of some of the top funniest comedians in Nigeria right now. Stanley Chibunna popularly known as funny bone was born in Kaduna,but he hails from Anambra State,he graduated from the university of Jos where he studied theatre arts,he is also an actor,according to him,the first money he earned from stand up comedy was N100,but that has changed now because he is rated as one of the funniest comedians in Nigeria. Helen Paul has been diligently representing the females in an industry dominated by the male folks. Apart from being an actress and a Tv host,Helen Paul is also a stand up comedian and a singer. Popularly known as Tatafo,the funny woman is gradually carving a niche for herself in the Nigerian comedy industry. Her first shot at standup comedy was when she was an undergraduate at the university of Lagos,she attended a show but the stand up comic billed to perform failed to perform,her friends then encouraged her to perform. Helen eventually performed in place of the comic and ended up stealing the show,ever since then,she has been performing in different stand up comedy shows across Nigeria. Gordons is also one of the funniest stand up comedians in Nigeria today,and is also known for saying “Hallelujah” in between his jokes. Gordons calls his Comedy Barlusconi under the ODP political party (Osusu Democratic Party) apart from his regular stand up comedy performances,he also has a CD compilation of jokes which he sales under his Gordons Comedy Klinic Wards. Basketmouth is one of the few Nigerian stand up comedians that has taken stand up comedy to another height. He is rated as being one of the best,if not the best stand up comedian in Nigeria. Bright Okpocha also organize and host different International stand up comedy shows and events outside the shores of Nigeria. He also has a lot of endorsement deals and also popular in other African countries. Another stand up comedian that is worthy of a mention is Bovi Ugboma,popularly known by his stage name Bovi. Apart from being a comedian he is also an actor and he anchors different high profile events. Bovi hails from the south south part of Nigeria and regularly performs on events hosted by Basketmouth. Most often when he is on stage,he uses the name “Akpos” in most of his jokes. Even his name sounds funny,Akpororo is rated as one of the funniest stand up comedians in Nigeria,he is one of the comedians that mixes comedy with music. He has managed to combine regular stand up comedy and Christian comedy if there is any word like that,because he also performs in different Church organized events across the country. He is definitely one of the funniest comedians in Nigeria,even his physique is absolutely funny. I go die is known for his funny jokes on poverty,politics and how he eventually escaped from poverty,he is also known for his colorful suits and personal sense of fashion. He is also rated to be among the top comedians in Nigeria,apart from that he is also among the richest comedians in Nigeria. AY is one of the most innovative comedians in Nigeria. His comedy event AY live is attended by Nigerians from different works of life. AY is also an actor,his comedy movies are also one of the highest selling movies of all times. With all these accomplishments he is also rated as one of the richest comedians in Nigeria. AY is also a musician and a TV host. One of the funniest comedians in Nigeria is Seyi Law,he is known for being dramatic on stage where he also showcases his acting skills. He is rated as one of the funniest comedians in the industry. Popularly known and called Uncle Saka. He became very popular after he sang the MTN orchestrated advert song “I Don Port go MTN”. Saka was an Etisalat brand ambassador (now 9mobile) before switching sides to become an MTN brand ambassador for a deal of about N20M. Uncle Saka is not a regular feature in the world of stand up comedy in Nigeria but he is still rated as one of the funniest comedians in Nigeria. He is a Lecturer, a Singer and an actor,he has been featuring in a lot of comic movies lately. Julius is one of the top comedians in Nigeria. He goes by the nickname ''Julius d’ Genius''. Apart from comedy he is also into music and calls his band “Reel Liaf Band”. Julius Agwu is also popular for his concert shows that features other top comedians. Ali Baba has been credited as being the first person to make stand up comedy a bankable business in Nigeria. Ali Baba’s real name is Alibaba Akporobome and he is popularly called the Grand Comedian of the Federal Republic (GCFR) a title he gave himself. In fact Ali Baba is said to be the very man who invented the concept of Stand Up Comedy in Nigeria,he is also an MC for most top elite events in Nigeria,Ali Baba iis also a great actor,he has featured in a lot of top grossing Nigerian movies. 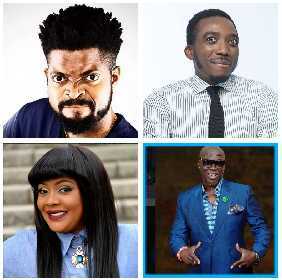 These is the list of the top rated and funniest comedians in Nigeria.